‘That is the best description of your mother I have ever heard’, replied his daddy as he ducked. Q: Why did the Pilgrims sail from England to America? A: Because they missed their plane. Q: When did the Pilgrims first say "God bless America?" A: The first time they heard America sneeze! Q: When the Pilgrims landed, where did they stand? 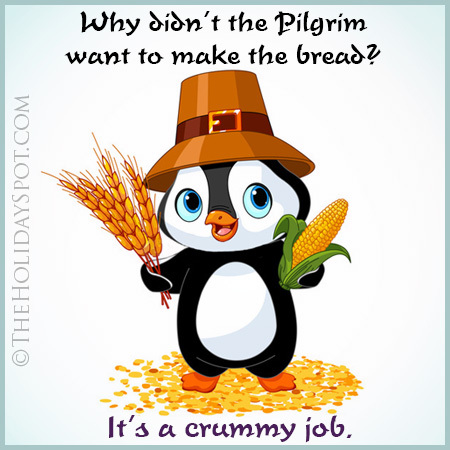 Q: What did pilgrims use to bake cookies? Q: What does a Pilgrim call his best friend? Q: If pilgrims were alive today, what would they say? Q: What kind of cars would pilgrims drive today? Q:What kind of tan did pilgrims get at the beach? Q: What kind of face does a pilgrim make when he's in pain? Q: What's the smallest unit of measurement in the pilgrim cookbook? Q: What's a pilgrim's mother called? Q: What do you call a pilgrims vocabulary? Q: What do you call the evil being that comes to get pilgrims? 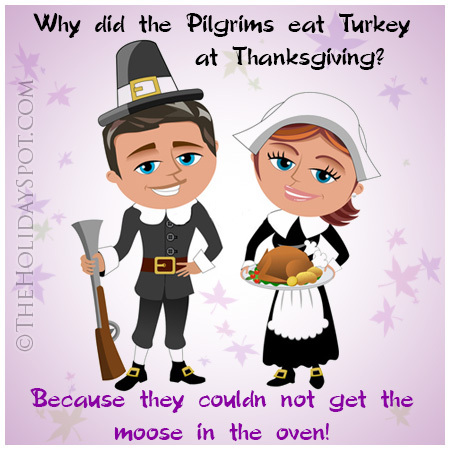 Q: Why did the Pilgrims eat turkey at Thanksgiving? A: Because they couldn't get the moose in the oven! Pilgrim John: I see thee cleaning hunting gear for the morrow. Dost thou plan on hunting bear? Pilgrim Samuel: Certainly not, John. I am shocked that thou would suggest it. I shall wear clothing as usual! Q: The pilgrims' cows came to America on what ship? Q: Why did the Pilgrim eat a candle? A: He wanted a light snack! Q: What happened to the Pilgrim who was shot at by an Indian? A: He had an arrow escape. Q: If April shower bring May flowers, what do Mayflowers bring?